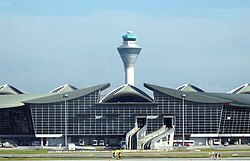 Kuala Lumpur Internaitional Airport (KLIA) (IATA: KUL, ICAO: WMKK) is Malaysie's main internaitional airport an ane o the major airports o Sootheast Asie. Built at a cost o US$3.5 billion in Sepang destrict o Selangor, it is locatit approximately 45 kilometres (28 mi) frae Kuala Lumpur ceety centre an serves the Greater Klang Valley conurbation. The airport haes the capacity tae haundle 70 million passengers an 1.2 million tonnes o cargo a year. As o 2013, the airport haundelt 47,498,157 passengers an wis Asie's fastest growin airport recording a 19.1% growthe year-on-year. It wis rankit the 11t busiest airport in the warld bi internaitional passenger traffec, an is the 10t busiest internaitional airport in Asie. It wis rankit the 28t busiest airport bi cargo traffec in 2013. The airport is operatit bi Malaysia Airports (MAHB) Sepang Sdn Bhd an is the major hub o Malaysia Airlines, MASkargo, AirAsia, AirAsia X, Malindo Air an Department o Civil Aviation (DCA). Wikimedia Commons haes media relatit tae Kuala Lumpur International Airport. ↑ "MAHB Annual Report 2017" (PDF). malaysiaairports. 9 April 2018. Retrieved 10 April 2018. ↑ "Airport Traffic Report" (PDF). 1998. ↑ "Table 2 – TOTAL CARGO TRAFFIC 2013 - Preliminary World Airport Traffic and Rankings 2013 - High Growth Dubai Moves Up to 7th Busiest Airport - Mar 31, 2014". Airports Council International. 31 March 2014. Retrieved 5 August 2014. This page wis last eeditit on 14 Februar 2019, at 19:49.